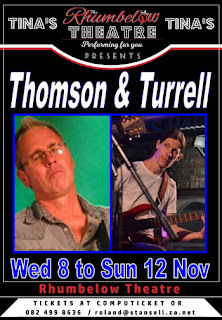 Rhumbelow Theatre at Tina’s Hotel, in Kloof will present Barry Thomson & Andy Turrell from tonight (November 8) to November 12. Andy is a multi-instrumentalist, with a crazy sense of humour, perfectly suited to add a fun twist on Barry’s repertoire. 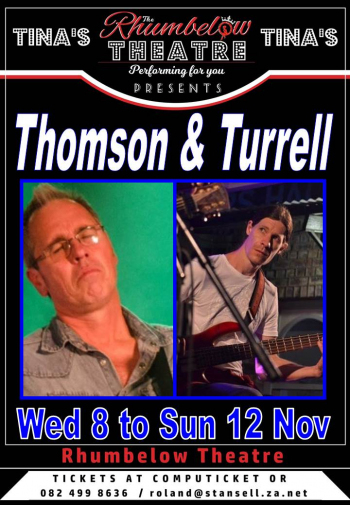 Andy’s drumming and guitar talents will be showcased alongside Barry’s and they will share funny stories about life and their times on the road. Performances take place on November 8, 9, 10 and 11 at 20h00 and on November 12 at 14h00. The venue opens 90 minutes before show for drinks.